Ergonomic Lighting makes us less tired and gives us better working conditions. This is reported from the staff at the hospital Nordlandssykehuset after six months with Ergonomic Lighting. In December of 2015, five operating rooms and three ambulatory surgery rooms at Nordlandssykehuset in Bodø, Norway, were provided with Ergonomic Lighting from Chromaviso as part of an extension to the existing hospital. In these eight rooms at Nordlandssykehuset, various procedures are carried out – right from gynaecology, gastric surgery, endoscopy, urology, gastric bypass, laparoscopy, arthroscopy to open surgery. 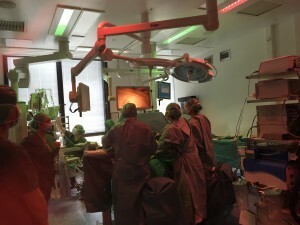 During an operation, the room is divided into coloured light zones that are adapted to the work carried out. In this way, each function gets the right light. ”Before we had Ergonomic Lighting, I turned off the light in the room. Now, we use the new light, and I am very happy with it. It is a pleasant light that makes me less tired during an endoscopic treatment. Today, we have light as well as good image quality on the monitor. We can regulate the light ourselves from a touch screen – it works very well”, says gastro surgeon Kåre Nordland. During the surgery, the nurses work in a red zone around the patient. ”Now, we no longer have to lower the light to darkness in the entire room in order to avoid reflection on the monitors. The red and green light works very well in my work. I feel less tired, and it is pleasant for the eyes for work in. It gives me more light, and that is nice – particularly during winter, where we only have a few hours of natural light in Bodø”, explains surgical nurse Anita Jensen. Ergonomic Lighting is flexible and can be set according to the different needs before, during and after an operation. ”Our patient light is very effective. Where the patient used to come into a room with sharp light, we can now create a more pleasant atmosphere. 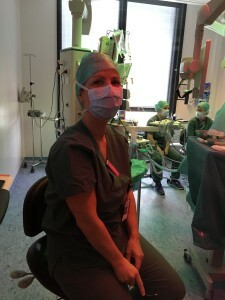 It calms our patients, who are often stressed about having surgery”, explains Anita Jensen. Ergonomic Lighting is fully integrated with the other equipment from Karl Storz Endoskope in the operating area. The department engineer in the medical technology department, Malvin Gismervik, was part of the committee that chose Chromaviso’s Ergonomic Lighting. ”We chose this light because it is a good light and because it can be integrated in our rooms with fixed ceilings and a centralised system. It is an advanced light and it works. We have not had problems with the light, and in my world, no news is good news. Reliability is important”, explains Malvin Gismervik. 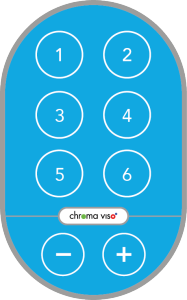 In the start-up phase, Chromaviso was in dialogue with the staff in the rooms in order to customise the light to the different operating rooms. ”The system is flexible, and it is possible for use to choose the light that is suitable for the specific situation. It is easy to use the light and switch between settings, and it is comfortable to work in. And when our needs change, we can adjust the light. For example, we have just had some zones changed and the intensity turned up”, explains surgical nurse Mathias Solhaug. ”In Bodø, we have been in dialogue with the users several times – and that is how we always work. We outline the workflow in the individual room and then program the light to provide optimal working conditions”, explains Anne Gitte Rugaard from Chromaviso.